Jeju Pacific Hotel is the triangular 11-story hotel conveniently located in the heart of downtown Jeju. The hotel is famous as all the guestrooms have private balconies. 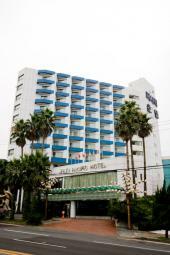 The hotel is conveniently located in the heart of Jeju city and there are many tourist attractions around the hotel! There is a shuttle bus service between the airport and hotel upon a prior reservation. Right after entering the hotel, a spacious and relaxing lobby welcomes a guest. In addition to the lobby which was made in the image of the natural beauty of Jeju Island, there are many interior inspired by the nature.